The mystery wool has now finished it's transformation into yarn. It's gorgeous! I am so pleased with this! I spun it thin so I can make socks from it. It's mostly wool - I got it to felt when it broke while spinning. BUT I think that some of it (especially the rather shiny white fiber) is nylon.....which is perfect (in combination with wool) for socks! 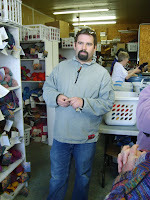 Initially, when I was given this roving, I was not that thrilled with it. It was kinda flat and fuzzy looking (I think that was from languishing in some one's stash!). Then there was the color. Yes, it had the blue as the main color (which I like), but it had some very vibrant splashes of other colors that I didn't really think went well with the base color. Ah, but that all changed once I put the fiber to the wheel....I REALLY liked the contrast and depth that the additional colors gave it. And there's even a hint of a purplish tint to the finished yarn....imagine that! I love how the yarn turned out. The skein weighs just over 6 oz. (about 175 g.) As for the length, I lost track EARLY in the skeining process.....I counted to 300 yards before giving up, so I think there's easily 900-1000 yards in this skein....possibly more! There's DEFINITELY enough for me to give the person who gave me the roving half of the skein...and for me to make a pair of socks with the other half! The mini skeins were my attempt to divide the remaining singles from the bobbin so I could ply them as well....but they came out rather uneven....one has twice as much as the other. I haven't decided if I'll bother plying these together or not. I may just add them to my ever growing mound of left-over "singles". Uh....today I started another project instead of finishing off a "work-in-progress" I needed to do some mindless knitting in the car on the way to and from my DH's Mema's. (It has to be "mindless" because I can't really look at what I'm doing or I'll get carsick!) 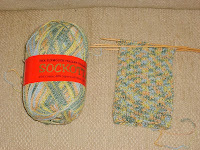 Anyhow, since it's spring, I decided to start a "Springtime" sock - it's in Sockotta and it's 45% cotton, 40% wool, and 15% nylon. The knitted result is a bit like an Impressionist painting....subtle, soothing color changes. 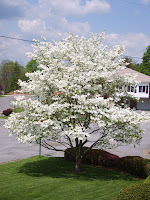 Again on the "Spring Theme", Mema's dogwood was in full bloom, so I couldn't resist getting a photo of it as well. I love this time of year - everything is so fresh, new, and beautiful! And the colors are so vibrant. It's too bad the fabulous colors don't last longer! I think Spring is finally here to stay. 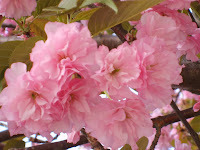 Our cherry tree was in full bloom this past week and is now starting to "blow off" the little petals - it looks somewhat like pink snow. 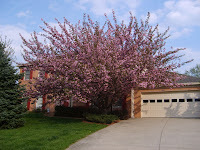 The cherry tree nearly obliterates the view of our house - but you can see how many blossoms there are. 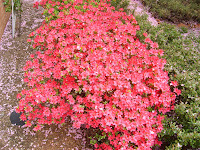 The azaleas are in full bloom now (at least the first batch!) 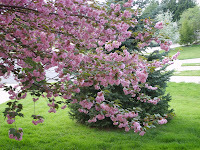 You can see the "pink snow" that's coming from our cherry tree next to the house and on the walkway. It looks pretty, but it's a royal pain when you track it into the house. On Wednesday and on Thursday I got fiber deliveries! The first was some generic fiber that I plan to use at the spinning demo at Frying Pan Park's Sheep and Wool Day on May 12th. 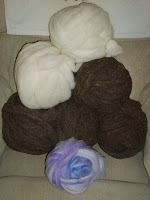 The other was some luscious roving that I bought from Rebecca (Becky). The first is cocoa brown merino (2 lbs worth). I'm thinking of making a snuggly over sized sweater or a sweater with matching leg warmers, neck scarf and mittens. I'm not sure if I'll over-dye it or not. The brown is so nice and rich, but it's not a color that looks good on me.The second fiber is a combination of 40% rambouillet, 40% alpaca, and 20% angora.....it's sooooo cuddly soft! I only got a pound of this one, and I'm thinking a nice delicate (possibly lacy) sweater with 3/4 length sleeves. The final bit you see (the colorful one) was a "thank you" from the seller....and it too is absolutely scrumptious! The white is Corriedale lamb and the blue, purple, and pink blended in is Columbia lamb. I'm SO tempted to order some of this as well. 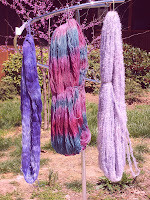 As if I need any more roving....especially with Maryland Sheep and Wool Festival coming up! Someone PLEASE talk me out of it! 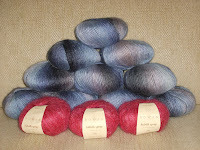 Today got to pick up my order of Rowan yarns.....direct from Angel Yarns in the UK. It actually came on Wednesday, but I had to wait until the weekend to pick it up as it needed to be signed for. The days went by soooo slowly while I was waiting to pick up my package! I got Kid Silk Spray (for another lace project.....still trying to figure out which one) and Tapestry. The Tapestry is wonderful - it's got lots of blues and a bit of pink/purple. It's 70% wool and 30% soy - and is incredibly soft! I haven't decided what to make with it, but I "had" to have it! 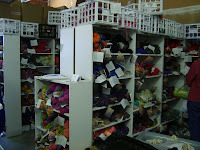 Angel Yarns in the UK is a fabulous source of all the British yarns....and they dispatch your order quickly! I definitely recommend them as a source for Rowan and other British yarns. Oh....I just joined the "Secret Santa Summer Holiday" on the Angel Yarns Forum - I did it last summer and had a fabulous time! I'm looking forward to another fabulous time! This past week I really haven't been knitting (except for a little bit at my knitting guild meeting on Wednesday). 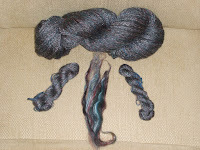 I've plied about 2/3 of the "mystery wool" that I finished spinning on Tuesday. It's taking FOREVER to ply since I spun it so thin - that's part of why it took so long to spin as well. It's coming out to be a sock or sport weight yarn - perfect for the socks that I intend to make from it! I should be able to finish plying by tomorrow! The weather has been fabulous! 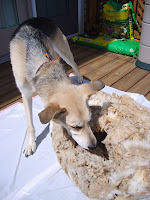 On Sunday, I laid out my Cormo fleece on the back deck and with the help of my "Guardian of the Wool" skirted the fleece. I love the picture of her "sniffing the wool"! She looks a bit disinterested though, once I laid it out. This is the first time that I really attempted to skirt a fleece. 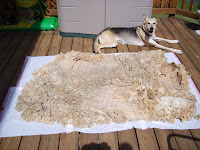 I didn't get rid of much, although there is a small area with quite a bit of VM.....I'll keep that separate as I wash it and card it - that way, if I decide it's not "worth the trouble", I can pitch it without losing any of the best wool. I had a very small amount of "second cuts" and little bit of wool that was only about 2" in length...there may be some more mixed in, but this was the "obvious" stuff. I kept the shorter wool and the second cuts and will be washing them as well - I may use that wool for felting and/or stuffing. The fleece was fabulous - almost no VM! The flock was blanketed, so that really kept the VM down. The lock shown here is one of the shorter ones - you can see how nice and white it will be once I have it all washed up. Quite a difference from the "outer layers" you can see in the big picture! At the spinning group tonight, I asked a fellow spinner (who's also a shepherdess) about skirting. One thing I hadn't done was flip the fleece over to search for and remove any second cuts on the interior side. I did shake it out a bit along the edges and removed some that way, but I didn't do a very thorough job. I may lay it all out again and look for second cuts on the inside.....or I may just check it as I begin to wash it.....a little bit at a time. 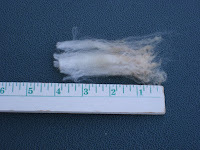 I also found out why the one area of the fleece was heavier in VM than the other areas. It turns out that sheep (and goats) favor one side of the body. Since the VM was concentrated on the left side, it appears that this sheep favored the left.....does this mean that she's a "left-handed" sheep? If so, it somehow seems natural that I would gravitate to this particular fleece! Back to tonight's spinning. I FINALLY finished spinning the "mystery wool". I'd nearly finished spinning it at the meeting tonight. When I got back home, I became obsessive about finishing it off - it only took another half hour...that's how close I was! Now, all I have to do is ply it! I can't wait to see how it looks when I'm done plying! I believe it's officially Spring! My friends, Elizabeth and Terri, and I all trekked to Misty Mountain Farm for a dying workshop taught by the very talented Linda Witt. We had a fabulous time and the weather was perfect! We even worked in a yummy potluck lunch on the screened-in porch. A warm and gentle breeze, a bright blue sky, great friends, lots of fibery goodness, and our fabulous teacher...what a perfect combination. I can't think of a better way to spend the afternoon! I'd never dyed yarn before, so I was like a "kid in a candy shop" - trying to figure out what yarn to dye and what colors to make it! 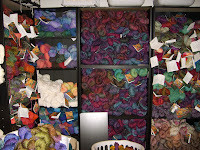 I ended up selecting three different yarns - sock yarn, mohair loop, and alpaca lace. This first skein took me FOREVER to dye. You know how it is - first time trying something new, you want to do it right, you're afraid you'll screw up, etc., etc. Well, the teal and mulberry sock yarn (super wash Merino) represents my first attempt EVER at dying! It was so much fun and was so easy! 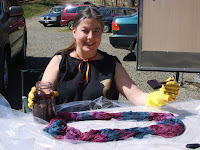 We used an acid dye (not Cushings, but another brand that I can't think of right now) and the mordant was citric acid. If you look closely, you can see that the mulberry color is actually two distinct colors. 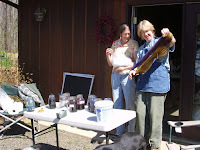 The darker mulberry was the original dye...the lighter mulberry was the freshly mixed dye. I am so pleased with how this came out! strove for rather pale "hint of purple" with a very slight difference in intensity - it came out exactly how I wanted it to! 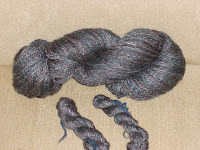 The final skein that I dyed was a lace weight Alpaca. It was luscious to fondle and really took the dye well. I decided to make this a somewhat variegated purple. 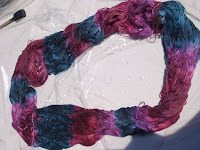 I used the same dye as I did with the mohair loop, but undiluted. I painted several areas dark, then several more slightly lighter. I then finished it by blending the remaining white areas with the diluted purple from the mohair look. I LOVE how this turned out! Can you tell that I "have a thing" for purple? 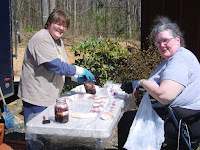 Terri and Elizabeth - busily dying their fabulous creations! 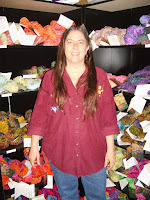 Linda even joined in on the fun and dyed a skein of her own. A close-up of the mini skeins that Elizabeth dyed specifically for her entrelac square blanket made entirely of leftover sock yarn. She "painted" some squares that she brought as well. 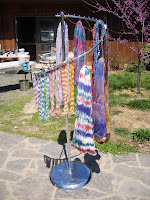 ***If anyone has any left-over super wash sock yarn, please send it to Elizabeth at Lizardknits! *** The rack shown is full of the yarns that we created this afternoon...with the exception of my purple alpaca lace weight...it was still "spinning" in the washer. These photos should help you envision the pastoral setting for today's excursion. 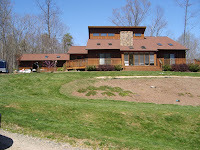 The studio is the left-most part of the building. You can just make out the tables in front of the studio where we had been working. Check out the vibrant blue of the sky! 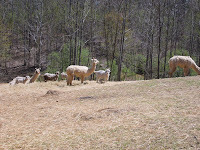 The animals are directly across the lane from the house....so, when we needed a brief rest, we could just sit back, relax, and watch the animals. Definitely a fabulous way to end the week! Swallowtail Shawl Has Been "Bound Off"! I'm so excited! After bemoaning the fact that I was "never" going to finish the Swallowtail Shawl late last week, I really kicked into "high gear". 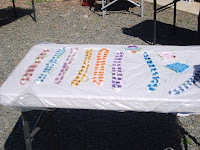 I had 2 rows left of "Lily of the Valley Border 1" at that time. Well, I really "got down to it" and finished "Lily of the Valley Border 1" AND "Lily of the Valley Boarder 2" and went right into the "Peaked Edging". Last night, before going to my knitting/spinning group, I got to within 2 rows of completing the "Peaked Edging". I'd planned to finish the final rows of the pattern as well as the edge finishing when I got home, but life intervened as it sometimes does. So, it was on to "Plan B": I finished knitting and "bound off" this morning before going to work! What a fabulous way to start the day! It felt soooooo good! I still have to weave in a couple of ends, soak it, and block it......but the hard part is done! This photo shows my progress by late last week (my "Very Secret SP10 Pal" said she wanted to see photos of the shawl "in progress"). At this point, I had just attached the 3rd ball of yarn, so it was approximately halfway done. 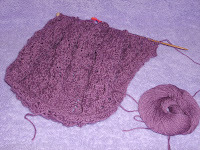 And here's a photo of the "bound off" shawl - it looks quite small because it's not blocked yet. As soon as I soak it and pin it out for blocking, I'll take another photo or two for comparison....perhaps with a yardstick nearby to provide the "before" and "after" measurements. On another note, I discovered yet another knitting quiz. I had very definitive answers for most of the questions....especially those relating to the volume of yarn and the number/types of projects! Spinning, Knitting, and Wonderful Surprises! 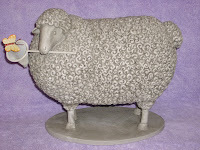 Sunday, I bought this sheep statue for my garden. However, when I got it home, I decided it was too cute to get all nasty outdoors, so I decided it would be an "indoor" sheep....I can use it to "model yarn" and other goodies! I've finally been able to get some spinning done. I spun a couple of hours Sunday and Monday evenings and have even managed to work in some spinning time BEFORE work in the mornings! Tuesday I even made it to my spinning group. I'm well into my second bobbin of "mystery wool". I'm still trying to spin as thin as possible so I can attempt to make a lightweight two-ply. I intend to make a pair of socks with half of it and gift the person who gave me the "mystery wool" with the other half. I managed to get a little bit of knitting in as well. I've completed another row on the Swallowtail Shawl. Geez....it seems like I'm averaging about 1 row per week. At this rate, I'm NEVER going to get it finished! I'm 2 rows from starting the 4th pattern in the shawl, "Lily of the Valley Border 2". I mailed the package to my "Secret Spinning Pal" in the UK on Saturday and she received it yesterday! That was fast! It turns out that Monday was a holiday in the UK, so this package REALLY sped it's way there - unlike the Easter card I sent my daughter. I mailed it LAST Tuesday and it didn't make it to Michigan until THIS past Tuesday.......I totally convince that it went by "Pony Express". My SP in the UK was a pleasure to get to know and I think it will be fun to stay in touch! And now, the fabulous part of today - I got a package from my "Very Secret SP10 Pal". It's a fabulous package! I love it! There's some very wonderful hand-dyed super wash sock yarn that she dyed herself - it's absolutely gorgeous! (It's the bright pink yarn in the picture). It's going to make some magnificent socks! 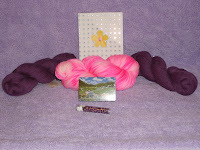 I also received some Knit Picks "Shadow" in a rich purple and some beads that match it beautifully. Now I need to figure out which lace pattern to use .....purple iridescent beads and purple yarn.....yum! Perhaps the "Scotch Thistle Lace Stole"? And....I got a deck of scenic "Colorado" playing cards. Thank you sooooo much! Mother nature really threw me for a loop this week - tanks and shorts early in the week and snow today. Not much snow, but still, snow in April! 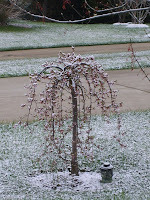 I love this shot of my neighbor's weeping cherry....dusted with snow. Thursday was bright and sunny and looked very "Spring-like". 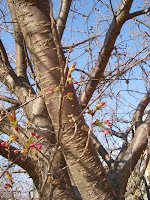 The buds on our cherry tree are FINALLY starting to open! 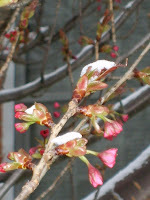 But then, today, that same tree was dusted with snow! I haven't had much time at all to knit! I have managed to get a bit of knitting in BEFORE going to work, but not much. My "big" accomplishment this week was to make a pair of booties....and ship them off to a friend in the UK (along with some other goodies). 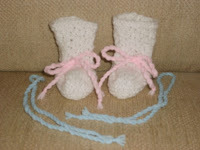 She's expecting her first baby, and since she doesn't know if it's a boy or a girl, I made my favorite booties in white and then made both pink and blue ties....that way, no matter what she has, she'll have the appropriately colored ties! I've made very little progress on my beaded scarf......translation of "very little" = No progress (Argh!!!!!). I know that once I get going again, I'll quickly finish up the first half.....and once that's done, I'll be motivated to finish the second half. I just have to get over that hurdle! I did manage another row on the Swallowtail Shawl....but it was a very painful row. I finished two rows, but had a major "flaw", so I tore back one row. After re-doing it, it was still wrong. I tried it once more. Finally, I decided to actually count my stitches (what a novel idea!) and found I was 4 stitches short. So, I ripped back and re-knit the previous row a total of 6 times before I got it right! That took 2 mornings! ARGH! If I keep this up, I'll NEVER have a completed Swallowtail Shawl! 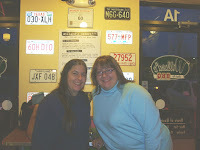 It all started Friday evening - Javajem (my hostess from SP9) met me at a local yarn shop. We shopped, chatted and knitted. It was great to finally meet her in person! Then, we ate dinner at Willard's (a wonderful Barbeque place).....they have great tasting reasonably priced food....including their wonderful mashed potatoes! We definitely have to get together again when we have more time to just knit and maybe even spin! I also need to head up her way and check out her local yarn shops! Saturday was spent on a field trip with the Purls of Distinction Knitting Guild and some members of the Waterford Weavers to visit Blue Heron Yarns in Easton, Maryland. Upon our arrival in Easton, we went to Legal Spirits Tavern for lunch before the trek to Blue Heron Yarns. The food was wonderful! I had a crab cake sandwich which was very good. I also tasted their famous creamy crab soup - YUM!!!! I finished the meal with a totally awesome dessert - a brownie souffle with molten bittersweet chocolate in the middle topped with whipped cream and ice cream. It was FABULOUS!!! 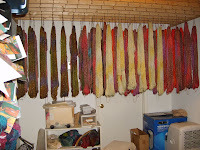 Here's some shots of the warehouse and some of the yarns drying in the back room. 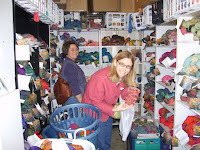 And some shots of a few of the happy knitters.....cuddled by all the fabulous colors and fibers! Lots of colors and inspirations here! Wow! What a weekend! I definitely found some wonderful close-outs - all in fabulous colors! This was definitely a "knitter's dream". And, tonight, I managed to fit in a bit of spinning to finish off the weekend. I really need to get back to knitting - I have too many WIPs! I definitely need to finish my Swallowtail shawl as I have several other shawls that I want to start as well!